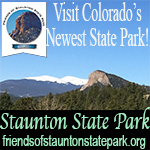 The current trail conditions at Staunton State Park vary from dry sections, to snow-packed, to 3-4" of hard packed wind blown snow, to extremely icy - all depending on the particular trail and the daily melt/freeze cycle. All trails, except Chase Meadow, remain open and are easy to navigate. 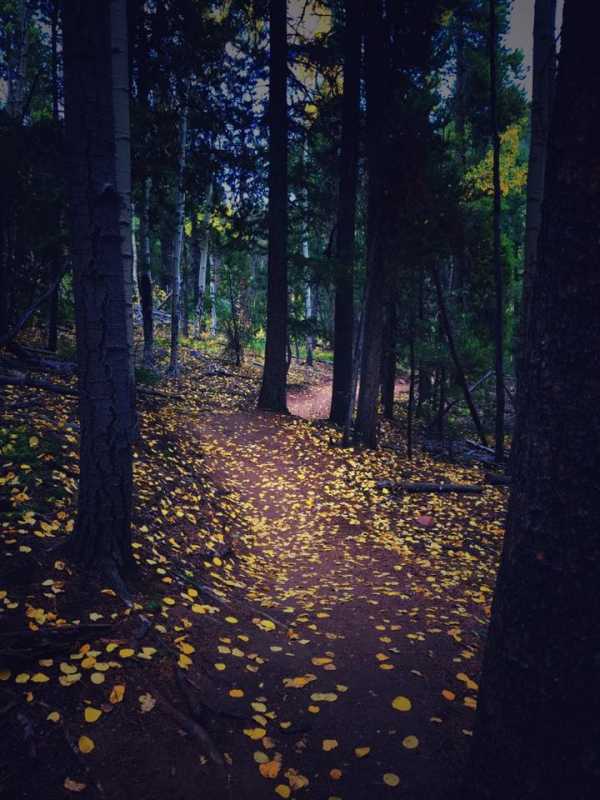 Factors such as temperature, recent precipitation, wind, trail elevation, shade and trail design all factor in on the conditions of trail surfaces. 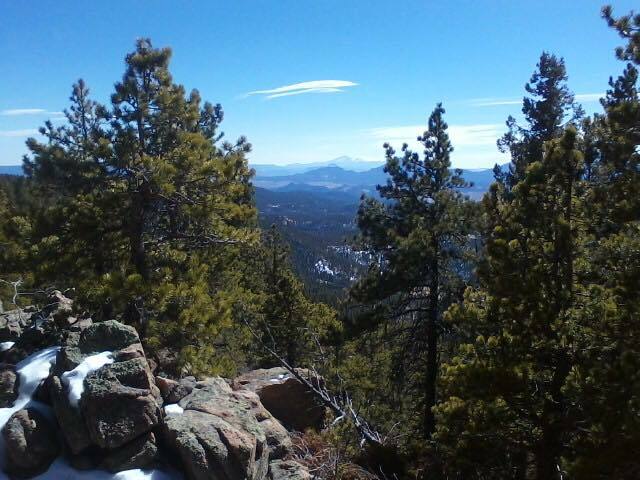 For example, a lower elevation trail with abundant daily sunlight will be mostly dry. The shaded areas will be snow packed and some icy sections. The trails closer to or above 9,000' in elevation will be mostly snow-packed with some areas of drifted snow and icy in spots. 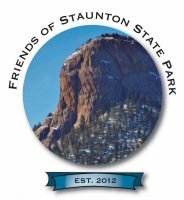 Our mission is working in partnership with others to preserve, promote, and protect the wildlife, natural beauty and historic legacy of Staunton State Park for current and future generations. 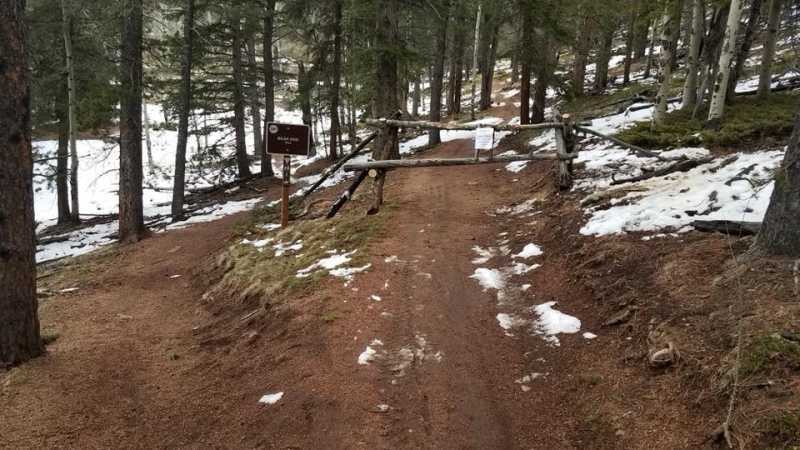 Staunton State Park has recently added important safety features to its higher elevation trails. 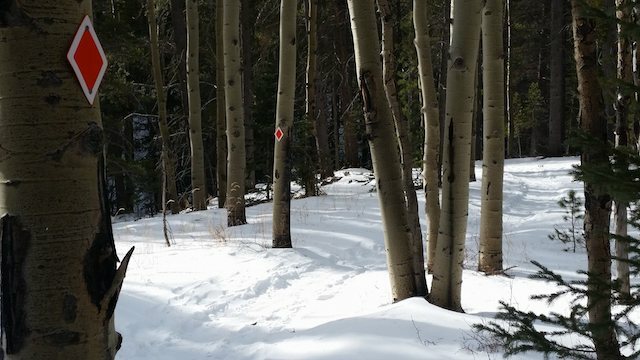 Orange diamond shaped signs were added to provide a clear visual reference for trail users when high snow accumulations have obscured trail locations. The high visibility signs have been added to the upper portions of the Mason Creek Trail, the Bear Paw Trail and to the West Meadow Trail. When hiking in the winter remember to dress in layers, take plenty of water and snacks, wear quality boots (with micro-spikes and/or snowshoes depending on the conditions) and don't forget the sunscreen. Staunton State Park's weather conditions can change in minutes so please - "be prepared!" At this moment, Staunton Ranch is about 60% dirt, 20% snowpacked and 20% icy. You can easily negotiate it with good tread hiking shoes. Beautiful time of the year to hike. Not many others on the trails = peaceful bliss. Bear Paw doesn't get much winter afternoon sun. Consequently, lots more snow up there. Upper Meadow Chase & Bear Paw = great for snowshoeing, especially good after a recent snowfall. Remember that biking and horseback riding are allowed on multi-use trails only; fat bikes are great this time of year. Hiker only on: Davis Ponds, Chase Meadow, Scout Line, Old Mill, Climbing Access, & Elk Falls. There's about 20 miles of multi-use and 10 miles of hiker only. Staunton's trail conditions have changed after the recent snowstorm and will probably be changing during the upcoming week due to the warming weather forecast. Currently, most trails are snow-covered and ice may be hiding underneath the snow. Micro-Spikes are recommended for all trails. 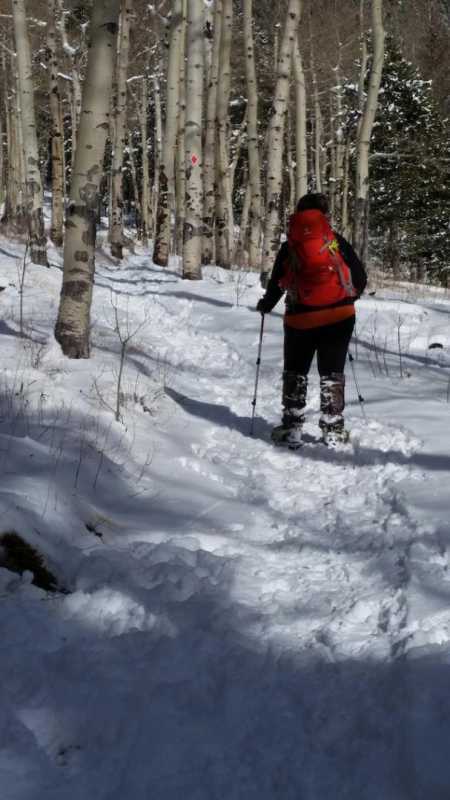 Some trails, especially in the higher elevations and western section of the park, are good for snow shoeing. 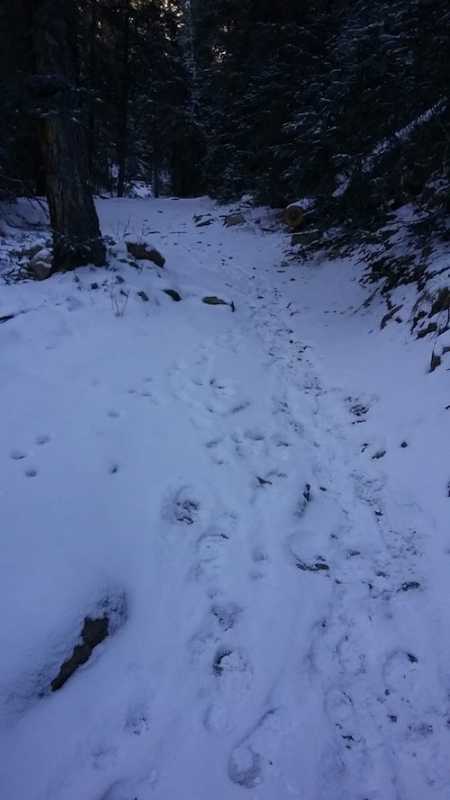 Portions of the following trails have a recommendation of micro-spikes because of icy conditions: Mason Creek, Bear Paw, Marmot Passage and Border Line. West Meadow (WM)--dry and snow packed in spots. Border Line (BL)--snow packed/icy--spikes rec. Bear Paw (BP)--(also Technical and Eagle View spurs)--snow packed/icy---spikes rec. Marmot Passage (MP)--snow packed/icy---spikes rec. 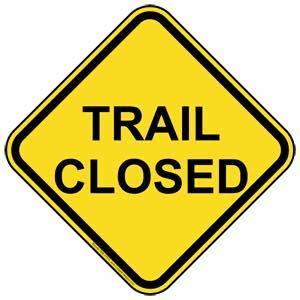 Today, Monday December 18th, Staunton State Park’s entire West Meadow Trail will be closed for the day. Our sawyer team will be conducting hazard tree mitigation. All other trails in the park remain open. Thanks for your understanding. Due to the recent storm, trails in Staunton State Park are mostly snow covered. The snow is shallow and some melt has occurred, but weather forecasts calling for more snow will ensure snowy trail conditions and warmer weather later in the week means melting and re-freezing. 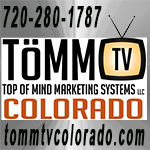 Expect snow pack and icy conditions. ****Caution**** Ice flows exist on the east side of Border Line trail and Lions Back trail at the junction of Chimney Rock trail. Be aware that these flows can be covered with a thin layer of snow and not readily visible. 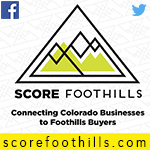 ****Currently, spikes are recommended for some trails in the park, especially at higher elevations. Skiing and snow shoeing are NOT recommended as snow levels are shallow. - An ice flow still exists covering the width of Border Line trail near the Old Mill site. 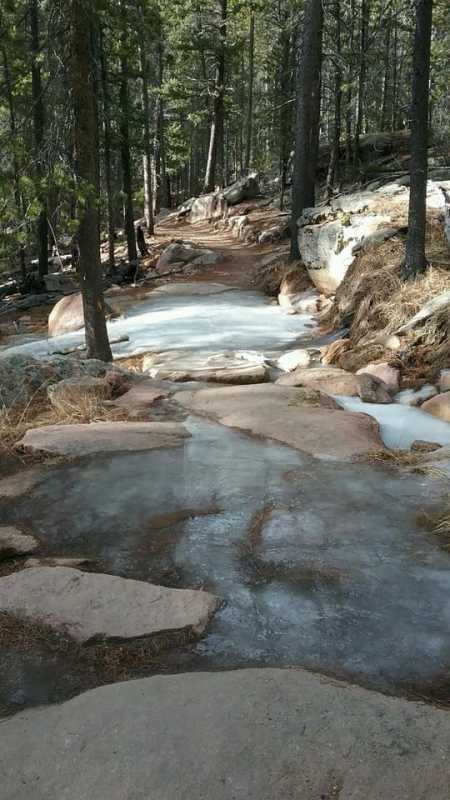 - An ice flow on Lions Back trail at the junction of Chimney Rock trail has grown larger in the last week. Lower trails: All lower trails including Staunton Ranch (SR), Davis Ponds (DP), Chase Meadows (CM), Cabin District and lower Mason Creek (MC) are generally dry. All climber access trails and the access road are generally dry. 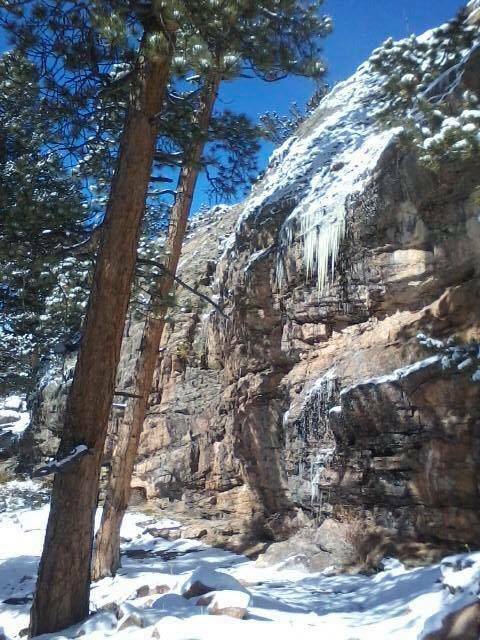 Mason Creek canyon--icy in spots but mostly dry. 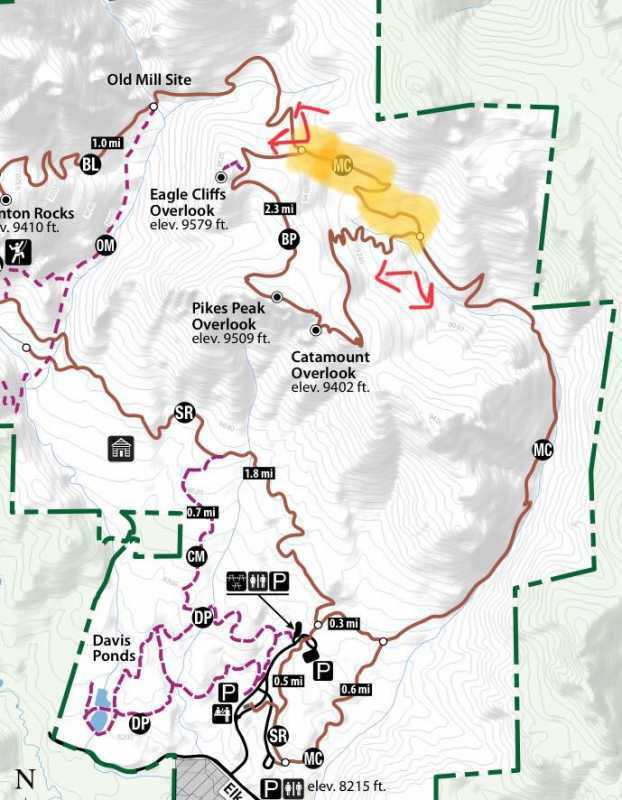 Chimney Rock (CR)--CAUTION---treacherous ice flow exists at junction of lower trail head---east side to Elk Falls trailhead--mostly snow packed with some slippery areas--upper and west end mostly dry with some snow packed spots. 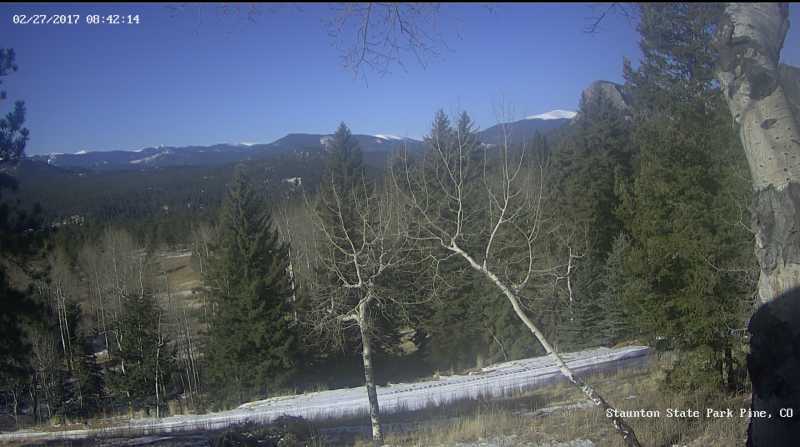 Lions Back (LB)--snow packed with some dry areas---Ice flow at intersection with Chimney Rock has grown larger since last week. Use caution in this area. We have not received any measurable precipitation over the past week. Staunton’s trails are unseasonably dry. There are short icy sections on the water crossings caused by the daily melt/freeze cycle. 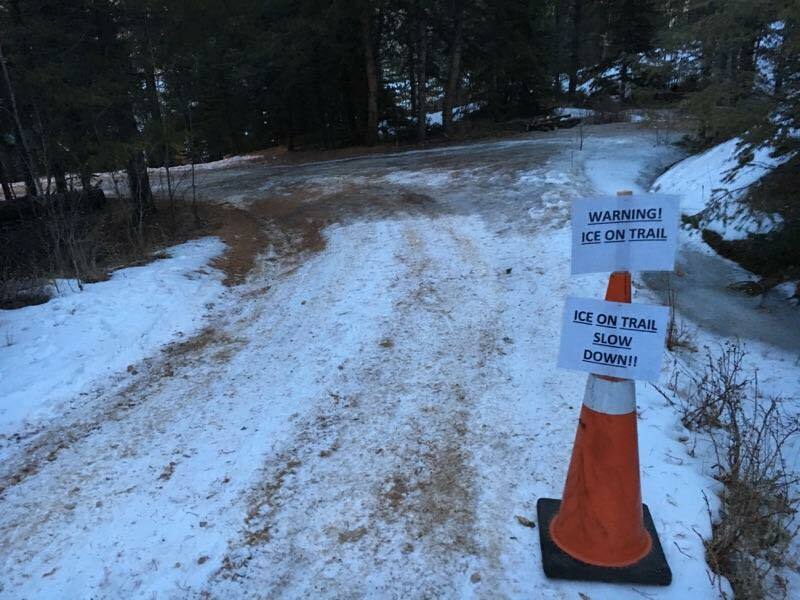 The short and dangerously icy section of Lions Back at Chimney Rock (downhill 15% grade & blind corner) has been marked with warning signs to prevent accidents. Our standard and much more detailed trail report will continue if/when we get some measurable snowfall. Conditions in the park have dried out considerably in the past week. All of the lower elevation trails and most of the upper elevation trails (with sufficient sunlight) are dry. 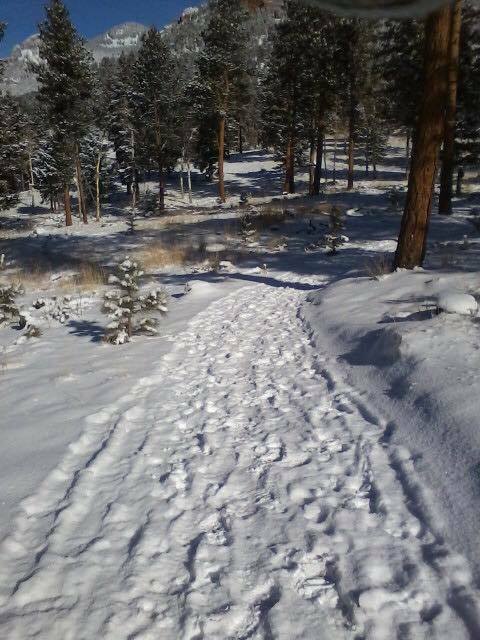 Higher elevation trails on northern slopes have sections which are either wet, slushy or icy. Expect drying to continue this next week due to the expected warmer temperatures. 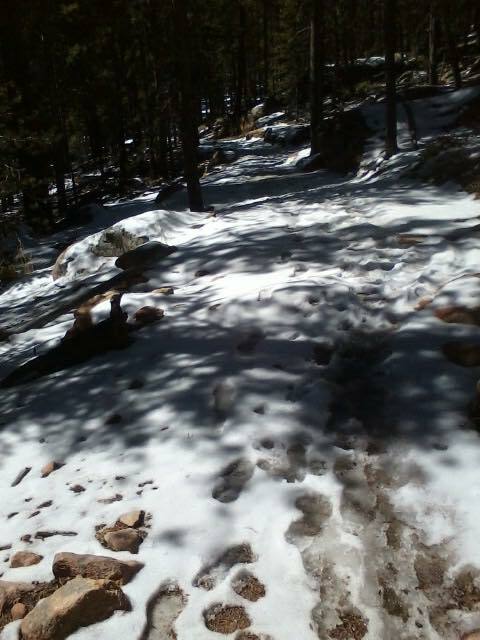 Rangers have spread sand on most of the icy sections of the higher elevation trails. Bear Paw Trail is about 60% muddy and slushy. It is recommended to give it an opportunity to dry out. 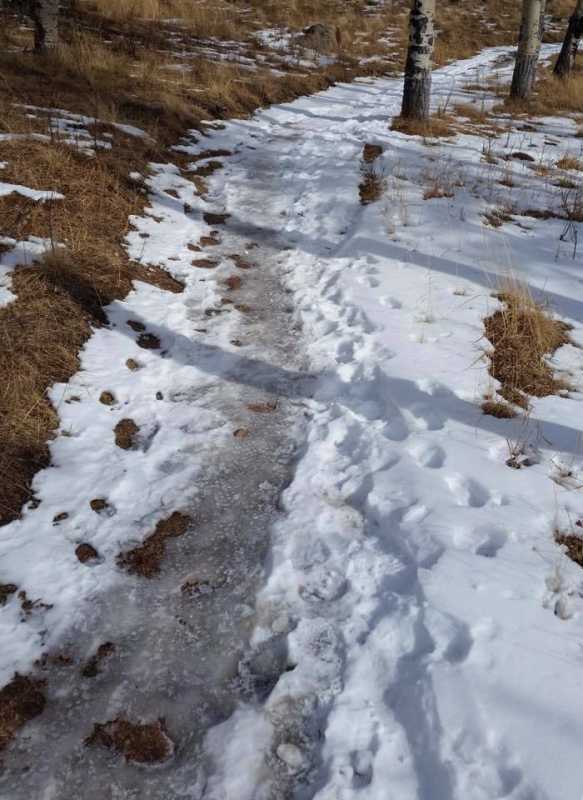 The ice flows continues to exist on upper northwestern Mason Creek trail near the aspen meadow but it has now been covered with sand. Ice still exists on Border Line trail near the Old Mill---bikers and equestrians should use caution on these trails. Mason Creek canyon--(MC)--small icy portions with sand spread on surface. Mason Creek--(MC)--mostly dry areas from TH up to Upper Bear Paw. Some snow packed and icy spots on northwest side. 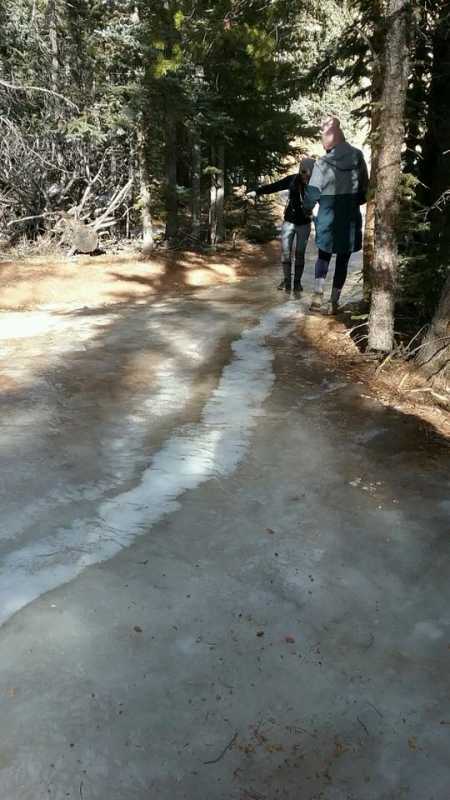 CAUTION--The large ice flow still exists near the aspen meadow, but sand has been applied. Bear Paw--(BP)--about 60% is muddy, snow packed and icy. Lions Back--(LB)--CAUTION--slushy at the trail head with Chimney Rock trail---upper trail is real muddy. 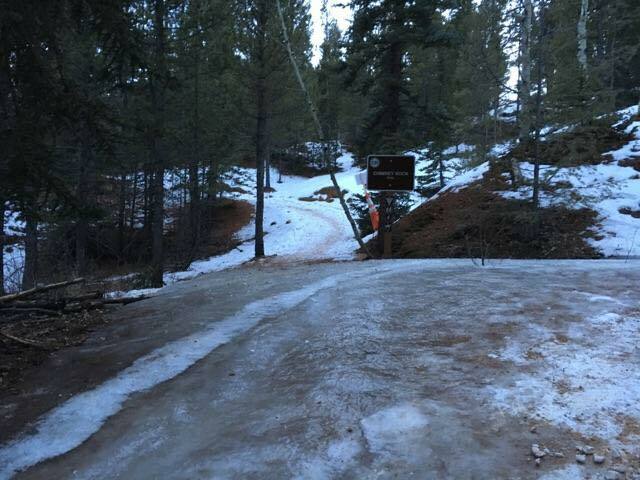 Chimney Rock--(CR)--CAUTION--Icy conditions exist from the junction with Elk Falls trail to the junction with Lions Back trail. Western sections of the trail is dry. Lions Head--(LH)--NOTE:---this trail closed March 15-August 1st for raptor protection. West Meadow--(WM)--upper trail is mostly dry with some slush---lower trail is muddy and icy in spots. Effective immediately, there will be a partial closure of a short section of upper Mason Creek Trail, between the two Bear Paw Trail intersections. The Mason Creek loop hike using the Old Mill and Staunton Ranch Trails is still possible with a detour onto Bear Paw Trail (see map). 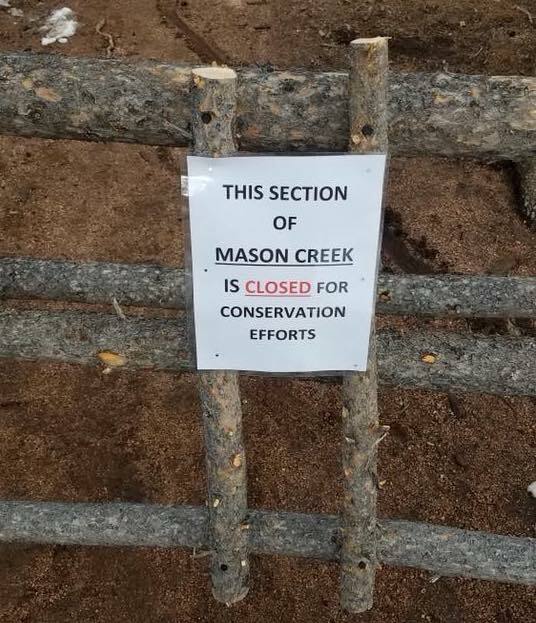 This closure is for the protection of Staunton State Park’s natural resources. 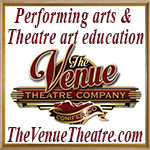 This closure is expected to last approximately 30 days. If you are looking for where you can still find fall colors, come for a hike at Staunton! The aspen leaves are peaking at higher elevations in the park, the trails at the lower elevations will be lovely in the next week. Check the Visit Staunton State Park Facebook Page for photos!